Now you can reward your employees with FREE admission to a unique land and sea adventure on board the wacky DUCK, plus discounts to great attractions. Starting from $6,700 per card per year, sign-up for our Friends of the DUCK Corporate Membership and enjoy unlimited benefits all year round. Free DUCKtours standard ride for 1 employee and up to 3 accompanying guests per card everyday. 10% discount on selected retail merchandise. 20% discount on birthday charters. 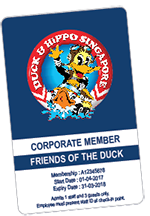 Friends of The Duck Membership - "Silver"
With "Silver" Corporate Membership, companies and institutions can now offer staff members with one (1) card. Friends of The Duck Membership - "Gold"
With "Gold" Corporate Membership, companies and institutions can now offer staff members with two (2) cards. Friends of The Duck Membership - "Platinum"
With "Platinum" Corporate Membership, companies and institutions can now offer staff members with two (4) cards.